A pachyderm playdate is not quite what Mom and Dad had in mind. Ezra, a white tot with thick, boxy glasses and a smattering of freckles, has a friend coming to play. Mom and Dad (both white) expect a “little friend,” but they are mistaken. A great big elephant named Finley comes galumphing through the door. Finley and Ezra have a lot of fun until the adults start making rules. Silly rules like: “No running in the house!” or “Only use inside voices.” There are even more rules outside: “Don’t ride your dad’s bike.” (Elephants are quite heavy.) “Don’t help water your mom’s plants.” (Squirting water from one’s trunk can be powerful.) And “Don’t dance in the tree house.” (For obvious reasons.) But when there is suddenly an elephant-sized hole in the roof, that’s when the playdate needs to end. Tables are knocked over, stair railings our broken, and walls are cracked—Mom and Dad are frazzled. But Ezra has had a grand time. 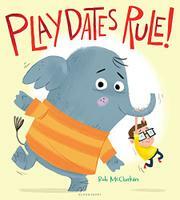 McClurkan’s endearing pachyderm pulls a variety of expressions, from glee through worried to apologetic. The family is homogeneous, but neighborhood residents exhibit pleasing diversity.